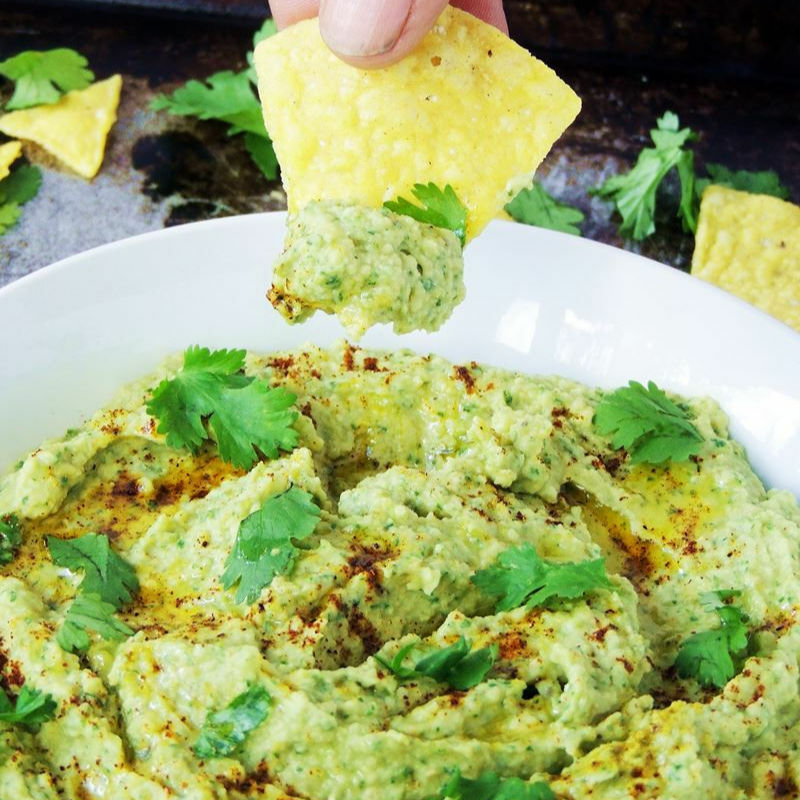 Zummus (Zucchini Hummus) - This keto zucchini hummus recipe takes hummus to the next level with fresh grilled zucchini. If you haven't noticed, I really like hummus! I mean like reallllllllly like it. So I am always on the prowl for ideas to pop into my food processor to make a new flavor. Once I make it, I usually slather it all over everything, and have been know to just dive right in fingers first to get that last little bit that is hanging on to the side of the container. Well you can't waste it!! So between my little brain always working to find new ways to enjoy it's creamy goodness, a ton of zucchini growing in my garden, and my friend Ann from Sumptuous Spoonfuls gathering a bunch of us bloggy peeps together to all come up with our own versions, zummus had to happen. I mean, you know it is bound to be delicious with fresh grilled zucchini, a bit of garlic, cilantro, and tahini. How could you go wrong? Plus I just like the word zummus! It is fun to say, try it with me, zummmmmmmmmmmmmmusssssss. See, fun right? Am I showing my crazy again? Damn, I hate it when that slips out!! Okie dokie then, let's get off my obvious lack of meds and back to food. That is something we always agree on. So Ann and my other food blogger buds are all making our own versions of zummus and I for one can not wait to see what everyone comes up with. I went with a slightly Mexican (who me go Mexican??) version by adding some cumin and cilantro, but kept it clean and simple with zucchini being the main ingredient. I had to let it sing it's little green veggie heart out. Now, let me take a moment to get myself together here before I tell you what the first thing was that I made with it. I took fresh sliced Italian bread put some arugula, grilled peppers, sliced turkey, and muenster cheese on the bottom slice. Then I spread, and by spread I mean I slapped that stuff on like spackle, on the top slice. Place it carefully in top of the towering pile of yumminess, and shoved it into my pie hole! OhhhhEmmmmmGeeeee people. Seriously! OK I need another moment. WOW! It was hands down theeeeeeeeeeeeeee best sammich I have ever had. Kevin was eyeballing the other half of my sandwich because I never eat a whole sandwich at one sitting. I casually reached out and pulled my plate closer. Not so fast Mr, that there is my sammy!! He pouted as I ate every last bite. 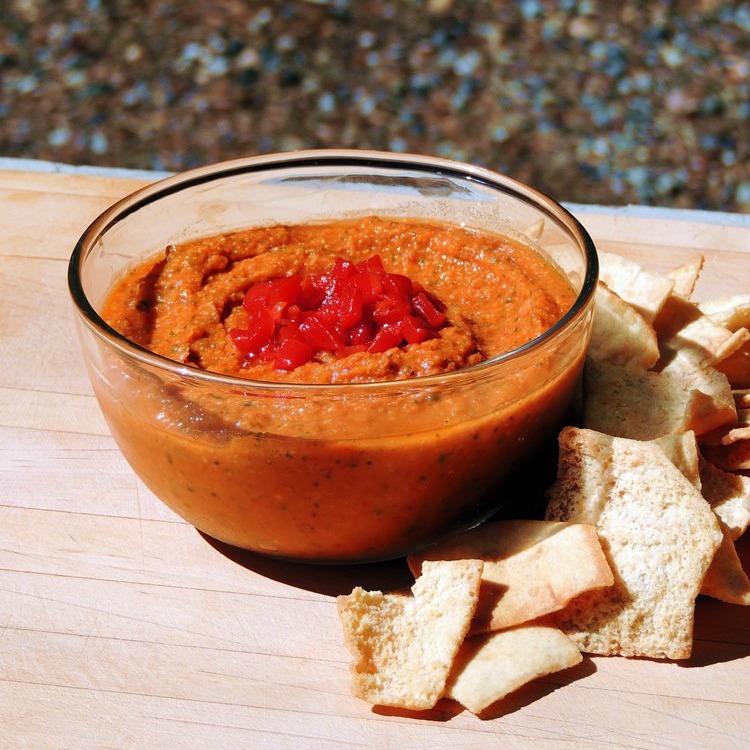 This zucchini hummus recipe takes hummus to the next level with fresh grilled zucchini. Sprinkle zucchini planks with salt and pepper. Heat your grill to medium-high heat, and oil the grates. 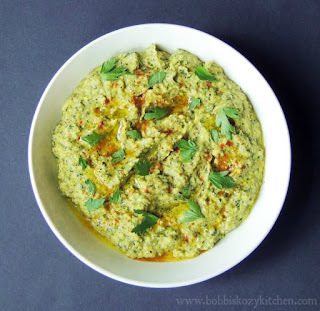 Spoon the hummus into a bowl and top with a drizzle of olive, sprinkle of paprika, and a few cilantro leaves. Awesome!! I am excited for you to try it. 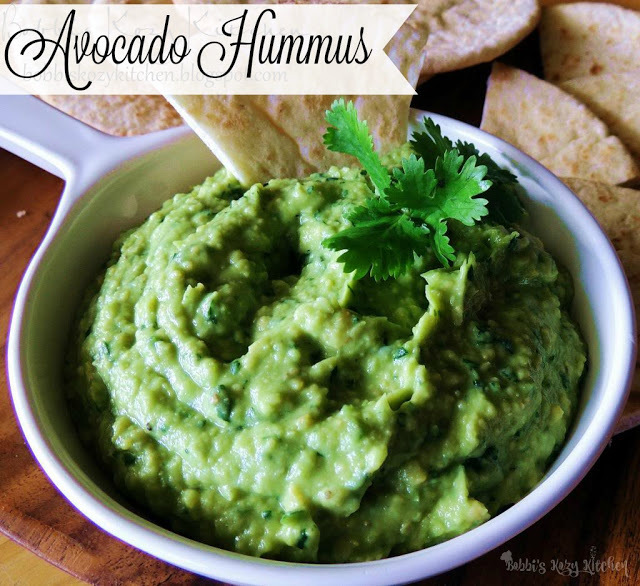 I have been eating it on everything from pita chips, to fresh veggies, to sandwiches.....YUM!! I LOVE the story of the sandwich ... your zummus sounds so good! I am going to have to try your recipe soon. Thanks for humoring me and accepting the challenge. Thanks Ann! I love yours too :) yes, that sandwich is amazing, and I am still hording my whole sandwiches!! 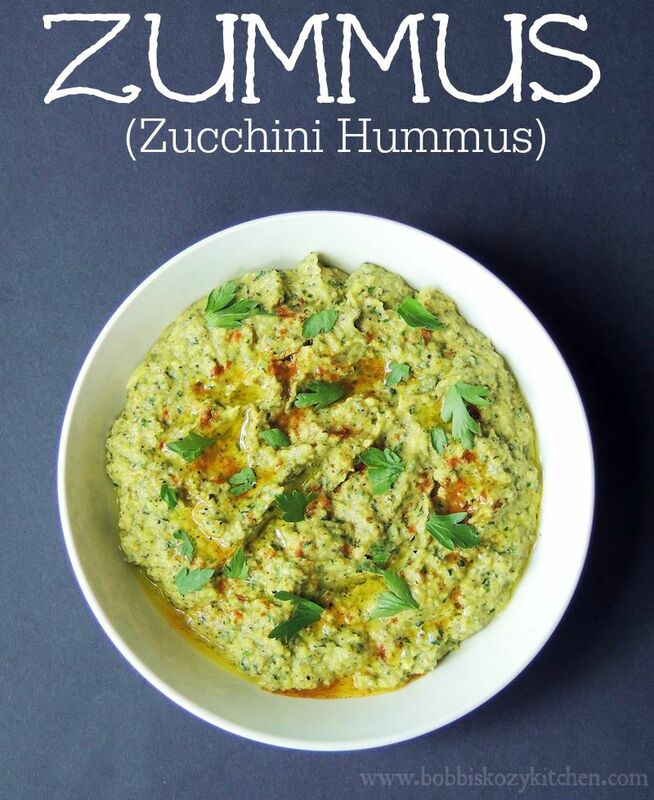 Thanks so much for your beautiful dip and the inspiration to make my own ZUMMUS! Thanks Justine! Yours sounds fantastic!! Am I missing something? I thought hummus needed Garbonzo beans (Chickpeas). I have never seen a recipe for hummus that doesn't include them... The recipe looks great other than that!